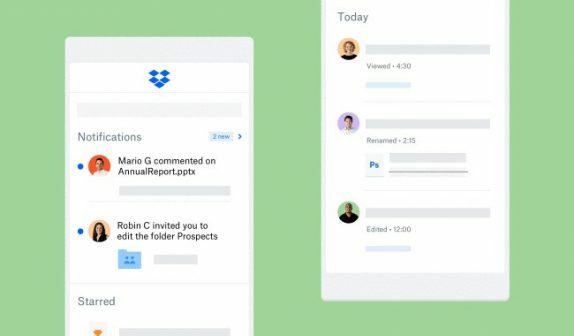 Dropbox is now rolling out a bunch of new features to its mobile applications including new activity notifications, streamlined file preview, important items, with starred files, and recent work under one roof and more. The file activity feature lets users preview a file in Dropbox, one tap will bring up a list of events, including edits, shares. Dropbox for Professional and Business Advanced users gets viewer history. The streamlined file previews allow users to easily comment right alongside their content. At the bottom of any file preview, users can access teammates’ feedback, add their own feedback, and get file activity updates. It is also making sharing buttons more prominent throughout the app, so you can quickly and easily send your work over to the people who need it. The company is also centralizing Home screen that brings straight to your most important items so you don’t waste time searching files when on the go. In the file browser, you can switch over to gallery view to see large thumbnails instead of a file list. The File activity feature is available today on iOS and will be rolling it out to Android soon.